5. Quinoa Salad with mixed vegetables, curried black eyed peas and sweet potato. 1.Boil black eyed eyes peas for 30 minutes on med- high heat. Season with knorr seasoning, curry, thyme, cilantro. 2. Peel and slice the sweet potatoes, then Boil them for 20 minutes on med-high heat and set aside. 3. Microwave/ warm frozen mixed vegetables. Then set aside. 4. Boil quinoa mix for 20- 30 (based on preferred softness) minutes and then set aside. 5. Place the quinoa in a bowl, add the mixed veggies, add sweet potatoes, black eyed peas and toss. Ingredient: 2 cherry tomatoes, peaches, Lettuce, 1 Green Pepper, 1/2 cup of Pumpkin seeds, 1/2 cup of black olives, and Kraft’s vegan Italian Dressing. Add 2 cups of water (16 oz) to a medium-sized pot and let it boil on medium heat for 5 minutes. Peel 2 medium plantains and slice each plantain into three and add it to the boiling water. Let it boil for 15 – 20 minutes. Peel the avocado and squeeze the lemon into a cup. Diced the tomatoes and onions. In a bowl, add peeled 1 medium avocado and mash the avocado until its creamy (or your desired texture). Add diced onions, diced tomatoes and fresh cilantro leaves (or you can use the cilantro flakes, can be purchased at a grocery store in the spices section). Mix everything together, then, add lemon juice from the squeezed lemon and mix together. 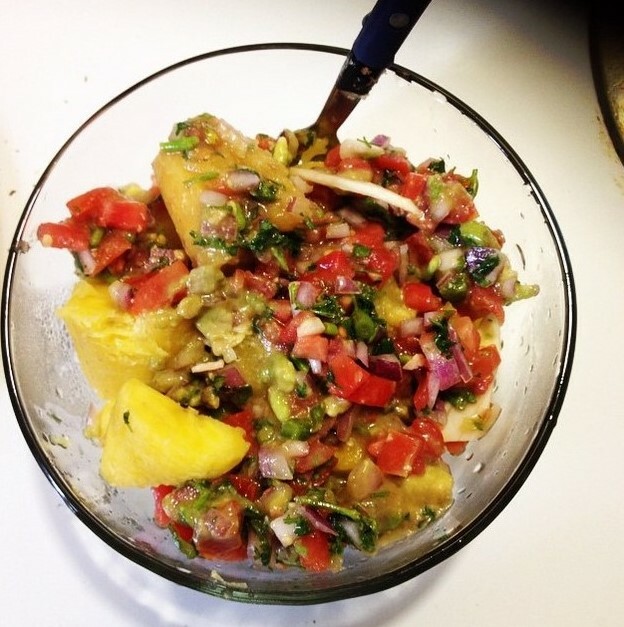 Serve the boiled plantain and add your fresh guacamole on top! 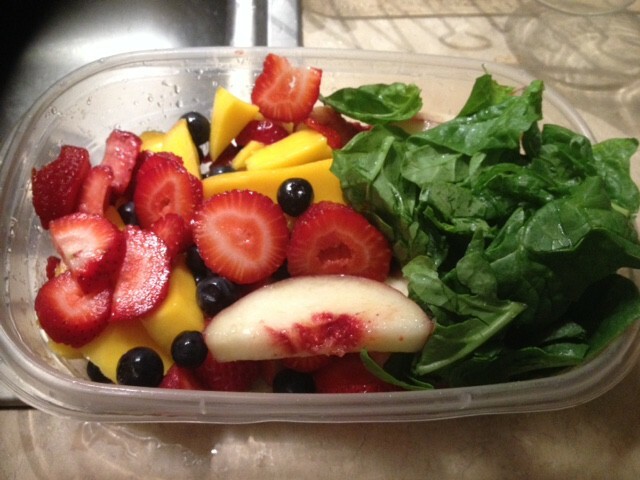 Add spinach to a bowl, dice all fruits as desired and add it to the bowl. Toss spinach and fruit around as visually pleasing to you or as you desired in the bowl . Add 1/2 cup of soymilk and 1/4 cup of cashew to a blender, blend for 50 seconds (or longer for creamy texture). For additional sweetness, add 1/2 or one cup of dole tangerines fruit cup to the blender and blend with soymilk and cashew. 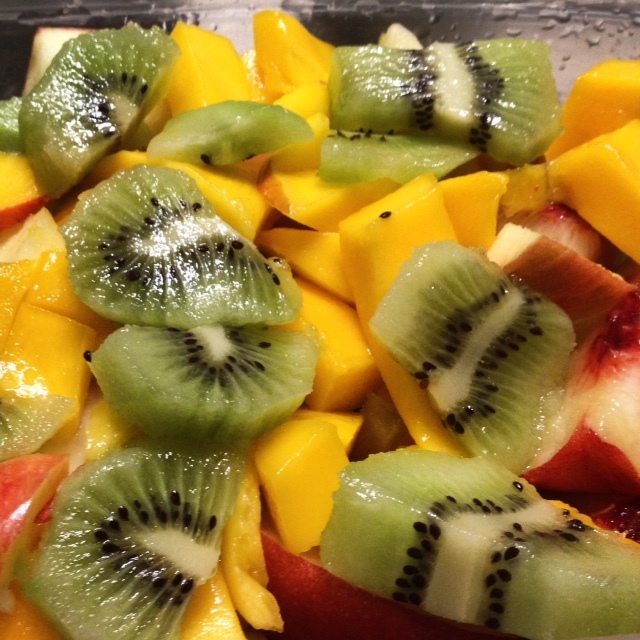 Pour the mix on the served fruit bowl and enjoy your fruit salad! Lunch is served! Bon Appetit! Dice all fruits as desired and lay them in a bowl as visually pleasing to you. Pingback: Easy to Make Lunch Recipes | FOWES: Eat,love,learn!